What is Liquid Rubber Made of? Spread Rate: The ideal thickness is 20 mil. and is achieved at 50 square feet per gallon on a smooth surface, or 45 square feet for a rough surface. Curing only happens during temperatures above 55° F. How quickly the peroxide decomposes dictates how quickly the product will cure which is dependent on both temperature and oxygen. Oxygen is a must, and helps the product to cure at lower temperatures. Temperature swings can impact the length of cure time, but the result will be identical. Liquid Rubber can take weeks to cure depending on outside temperatures, but it is immediately waterproof. This is not a product to fill holes, cracks or crevices, but it does provide a solid, smooth surface while filling these problems. However, it is best to repair and fill holes properly before application. Liquid EPDM should be applied to non-porous surfaces, free of holes, to supply a fully protected surface. Only one coat is necessary. Multiple coats will not be as strong as the first coat, and are not recommended. Never use EPDM Liquid Rubber if oxygen is not available. Oxygen is required in order to cure. However, oxygen can penetrate 20 mil. thickness and Liquid EPDM is a great choice for roofs. The thicker the application, the longer the curing process (and you risk swelling or bubbles). You can apply EPDM on extremely cold or hot days. The pot life is exceptionally long (4-6 hours), which gives you plenty of time to apply the product. Adhesion becomes stronger over time, especially on surfaces like metal, concrete and non-porous wood. Asphalt and single-ply surfaces are not recommended with Liquid EPDM unless a primer is applied first. Consider the surface condition before application. Liquid EPDM is a fantastic tool, but it can not work magic. Do not apply Liquid EPDM or any product to a surface that is in need of repair or replacement. No product can extend the life of a surface that is about to fall apart. However, if you are working with a sound surface, Liquid EPDM can extend the life of a surface for up to 20 years. EPDM bests other competition like acrylics and urethanes, but still requires a surface in good condition in order to be effective. Liquid EPDM comes in white and black. 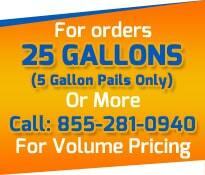 However, if you order over 100 gallons, you can customize the color. Keep in mind that Liquid EPDM can also be painted. Thinner: You can use most aromatic hydrocarbon or aliphatic solvents. Use weaker solvents with EPDM rubber. Chemical resistance: Fully cured Liquid EPDM resists acids, alkalis and polar solvents. Do not use Liquid EPDM on oils, fats or waxes.